A Great Tofu Dinner! (serves 2) | Crappy Kitchen - Good Dinners! Okay so last night I longed for food that would feel like injected medicine straight into my veins. You know those days when your energy is zapped and you are in dire need of some kind of booster shot? 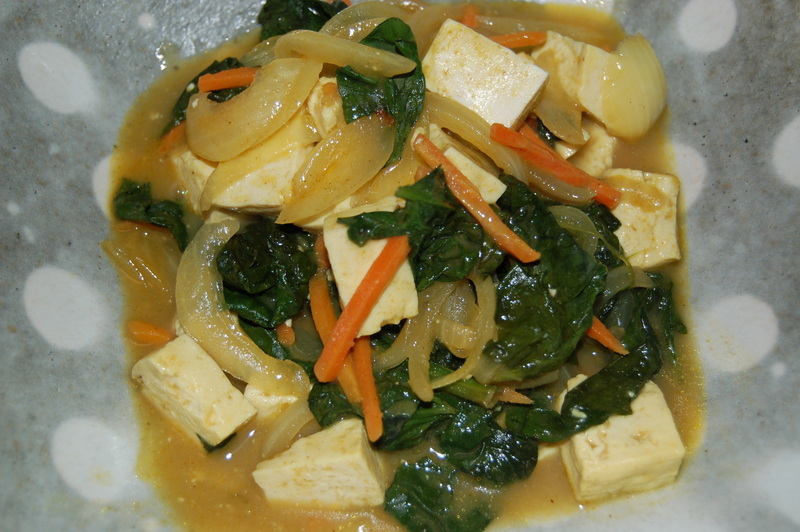 For some people it is a big hunk of steak barely cooked, but for me it is this: a tofu dish with dark greens, and the all-powerful, blood thinning, heart healthy onion! I spiced the whole thing up with curry powder and it was just what the doctor ordered. It was not only good for me, it tasted sublime too. The textures were silky and the broth was zingy and packed with flavor. I don’t regard this as a vegetarian or vegan dish but rather just anther great dish to cook for the whole family for dinner. Dinners like this are a great balance to some of the heavy food we tend to eat. You should really not take my word for it, but rather cook it yourself tonight! 1 – Put saute pan on medium heat and add the oil. Saute onions for about 5 minutes. Add the carrots and continue to cook for another 3 minutes. Add the curry powder and flour to the onion mixture and stir to incorporate with everything. 2 – Add the stock (or water and bouillon cube) and turn heat up a little. Bring to a simmer, stirring frequently. Taste for addition of salt and add at this time. 3 – Top with the spinach and stir gently. Bring back to a simmer, cover and turn heat down to low/medium and cook gently for 6 to 8 minutes. Divide between two bowls and serve as it (which is how I had it) or with bread or rice. This entry was posted in "Blood Type A " Recipes, dinners and tagged blood type A dinner, blood type A recipe, blood type diet, curry powder, fresh herbs, fresh spinach, onions and blood, onions and health, tofu curry, tofu dish, vegan dish, vegan recipe, vegetarian recipe. Bookmark the permalink. Not only yummy, but pretty as well!